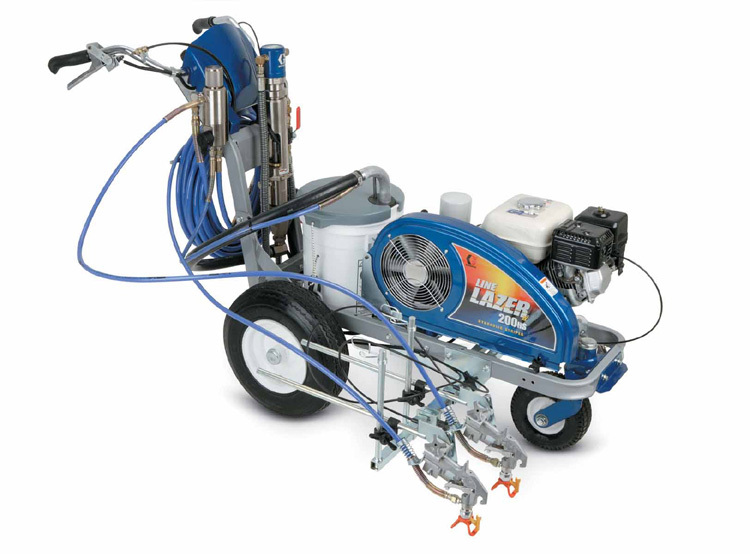 LineLazer IV 200HS | Alpine Products, Inc.
– High-capacity cooling system features a 20% larger hydraulic fluid reservior to keep the system running cool. – Innovative cooling fins wrap down and under the reservoir. – New cooling fan design delivers nearly 70% more air flow tothe hydraulic pump. – Improved belt alignment for longer belt life. – New auto-tensioning spring is center-mounted for consistent, smooth operation. YOU’LL LINELAZER IV FEATURES ON THIS HARDWORKING MACHINE! – Advanced Vibration Reduction System eliminates engine vibration for better line quality. -Rear gun mount allows placement of the guns closer to the rear axle for straighter long lines and smoother curved lines. – Lightweight gun holder minimizes gun movement caused by rough pavement. – New Chromex pump rod is built for the most demanding applications. – New flow-through Easy Out Filter comes out with the cap for convenient, mess-free access.